it went away but is coming back: the bus lane in East Arlington during the October pilot unsing the parking and bike lanes to speed bus transit. 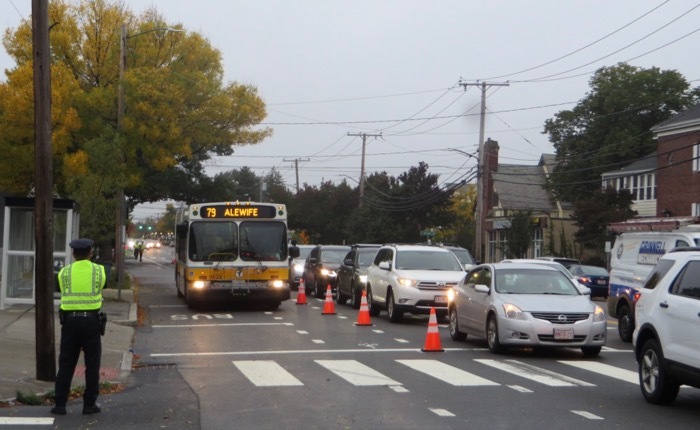 The Arlington Select Board approved a plan this evening to restore the morning bus lane to an eastbound stretch of Mass. Ave. in East Arlington. The bus lane would be permanent from the hours of 6 – 9 AM on weekdays. A 79 bus takes advantage of the temporary bus lane at about 7:15 AM on October 9, the first day of the pilot program. At Thorndike Street facing Arlington Center. 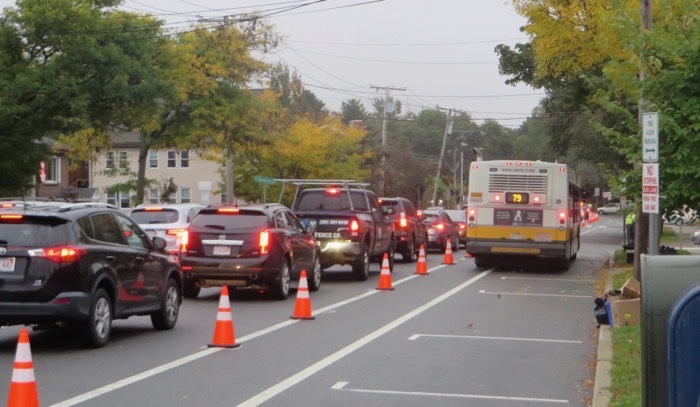 Paint, not traffic cones, would mark a permanent version of last fall’s temporary bus lane on Mass. Ave. under a proposal from the Town’s planning department made public earlier this week. The morning bus lane tested for one month last fall was highly successful and should return permanently “as early as next spring” according to a recommendation this week by Daniel Amstutz, the Town’s senior transportation planner. The Select Board will discuss the proposal at its February 25 meeting. 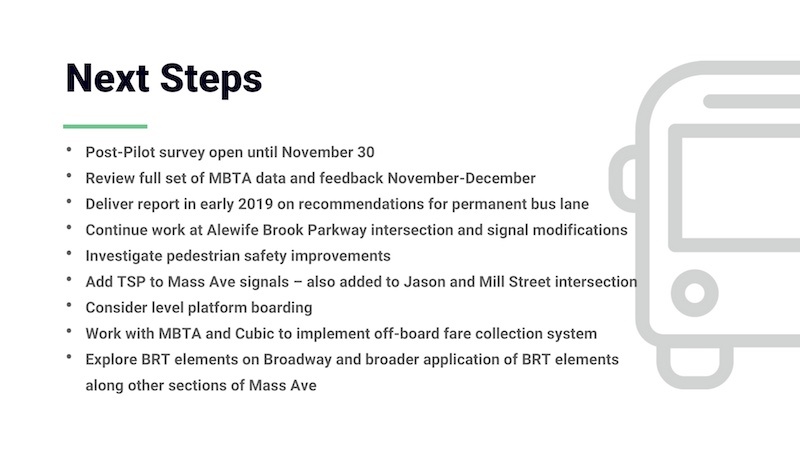 The proposal is silent on safety issues related to the crosswalk at Lafayette Street, where the Town removed a bump-out last fall to accommodate the bus-lane pilot. Arlington’s bus priority pilot program was featured with other Boston-area programs in a short video released last week by Streetfilms. Boston Area Bus Pilots Move Region Closer to BRT from STREETFILMS on Vimeo. The upbeat film, and the bus programs featured, are discussed further at Streetsblog. I am saddened to learn of the passing of Kevin Greeley the morning of November 24. A bus takes advantage of the temporary bus lane at about 7:15 AM on October 9, the first day of the trial. At Thorndike Street facing Arlington Center. 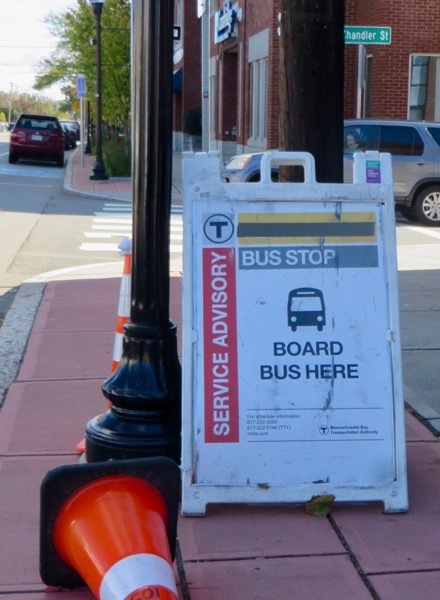 The traffic cones and police detail are gone, but preliminary data from Wayz and the MBTA suggest that the Town’s bus-priority experiment worked. The pilot’s three main measures reduced bus trip time by 5-6 minutes on average days without adversely affecting other road users, according to preliminary data. BUS PILOT ENDED NOVEMBER 9. NOW WHAT? 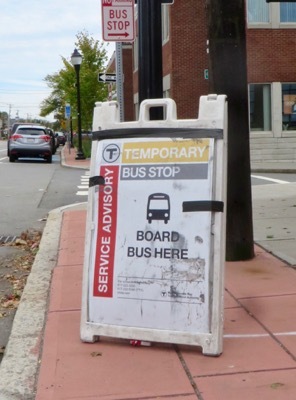 Two of the three segments of the Town’s bus-priority experiment, at Lake Street and at Route 16, are continuing past the end of the pilot program last Friday, November 9. That’s according to a November 12 announcement on the Town’s website. The third element is the bus lane. 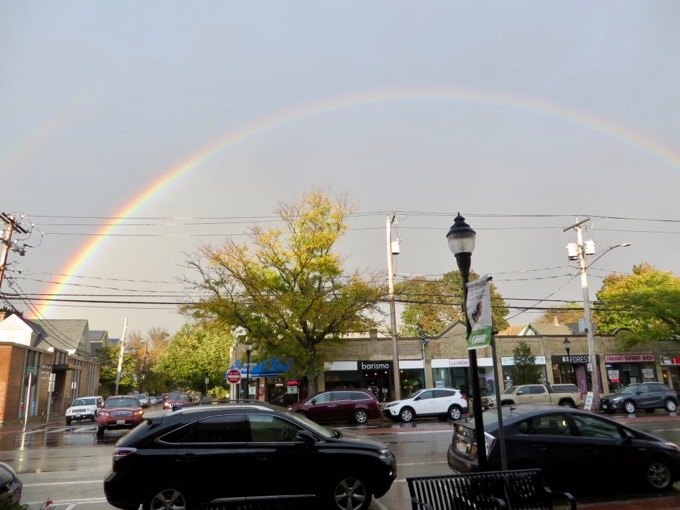 The Town made no statements about the future of the dedicated lane, noting only that the lane, and its related parking ban, are no longer in effect. The 79 bus takes advantage of the temporary bus lane at about 7:15 AM on October 9, the first day of the trial. At Thorndike Street looking back to Arlington Center. Arlington’s bus priority experiment will end on November 9. There will be a community evaluation of the program on November 14. Let’s inspect this work in progress by walking from Lake Street to Route 16. Mass. Ave. earlier this afternoon, facing Cleveland St.. The new location for the Cambridge-bound bus stop at Lake Street is permanent. Update: I completely misread this. Temporary sign to come down; the change is permanent. 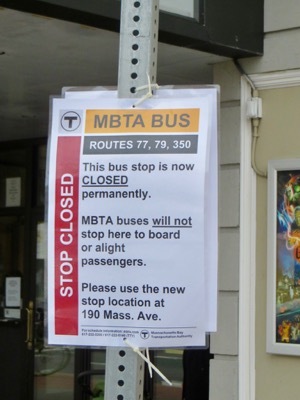 Thanks for clearing that up, MBTA! Just to be clear: Arlington’s bus-priority pilot program is just four weeks long.